Resilient Modulus (MR) is one of the most important stiffness parameter to determine the thickness of a pavement layer (AASHTO 2003 pavement design guideline). 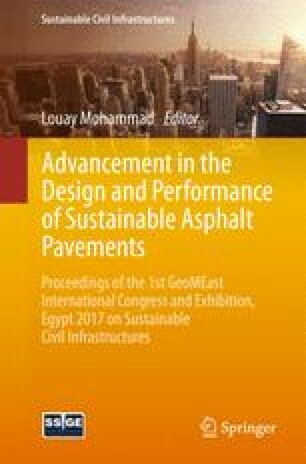 At present, the design procedure does not consider the effect of deterioration of pavement layers due to seasonal variations. Recent studies conducted by researchers on the variability of MR with wetting-drying (WD) and freeze-thaw (FT) cycles show that long-term durability is an important criterion to be considered in designing pavement base with recycled materials. However, limited study has been conducted to evaluate the effect of environmental deterioration on the reclaimed asphalt pavement (RAP) and recycled crushed concrete aggregate (RCCA) mixtures stabilized with cement. The objective of this research is to evaluate the durability of 50% RAP-50% RCCA mixtures stabilized with 4% and 6% cement subjected to 0, 4, 8, 16 and 30 wetting-drying cycles. Wetting and drying cycles were applied to the specimens after curing them for 7 days. Resilient modulus tests were then conducted on the specimens at the end of these specified number of cycles. Environmental tests were also conducted to assess the effect of WD cycles on the leachate quality. These tests included total suspended solids (TSS), total dissolved solids (TDS), turbidity, chemical oxygen demand (COD) and pH. Tests results indicated that with the increase in the number of WD cycles, the value of MR decreased by about 11% of the initial value at the end of 30 cycles. Results obtained from the environmental tests after 30 WD cycles were found to be within the permissible values provided by EPA guidelines.